The Hale Hamilton range of pressure relief valves are suitable for use within a wide range of inert, flammable and corrosive gases, many of which are approved to PED cat 1V. Available in a variety of materials, the Hale Hamilton range of valves are used within many applications including: Military Markets, Industrial Gas Filling, Mixing and Supply, Power Generation, Offshore, Pharmaceutical, Medical, Compressor, Laboratory, Blow Moulding and m any other Industrial markets. Pressures from as low as 0.03 barg (0.45psi ) up to pressures in excess of 550 barg ( 8,000psi ) are accommodated by our range of relief valves, available in a choice of different materials to suit the operating medium. Series RS Differential Relief Valves are available as Body Ported, Banjo Mounted in G3/8" or Cartridge Mounted for manifold applications in Brass, Nickel Aluminium Bronze or Stainless Steel. Set pressures range from 3.5 to 350bar with an orifice diameter of 9.5mm. Adiabatically Shock tested to EN ISO 7292 are available. 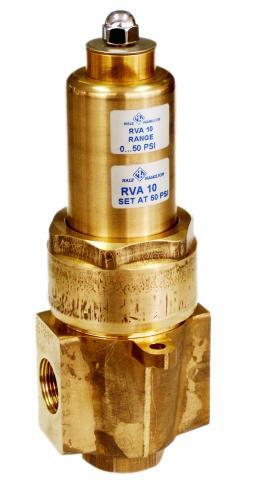 Series RVA Differential Relief Valves are inline, body ported, available in Brass & Nickel Aluminium Bronze. Set pressures range from 1 to 448bar with orifice diameters from 6 to 19mm and port connections from G3/4" to G1". Adiabatically Shock tested to EN ISO 7292 are available. Series LPR are a range of Low Pressure body ported Relief Valve available in Brass, Nickel Aluminium Bronze & Aluminium. Set pressures range from 0.03 to 4bar with an orifice diameter of 8mm and port connections of G1/4" & G3/82.